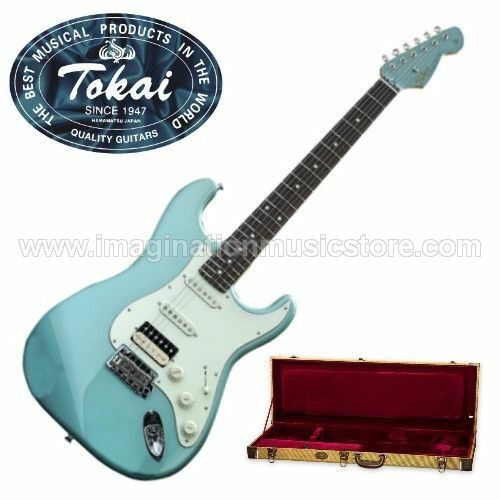 Tokai AST-96SH OTM Ocean Turquoise Metallic with Matching Headstock Limited Edition Vintage Series is a combination of the much loved traditional, ST-type electric guitar handmade in Japan with carefully selected tonewoods and high quality parts based on the vintage 50's and 60's ST style but with hot rodded parts crafted for demanding modern players! The Tokai AST-96 OTM has an alder body and one piece maple neck with a glossy finish, with 22 medium jumbo sized frets and 9.5" radius for easier playability. This limited edition model is also equipped with Gotoh F510T Two Point Tremolo, ST-Vintage MK3 pickups for neck and middle and Seymour Duncan Trembucker TB-16 59 Zebra on bridge pickup and Gotoh Magnum Lock machine heads for ultra stability tuning. The gorgeous classic Ocean Turquoise Metallic color has a gloss poly finish, beautiful mint green with ivory knobs and nickel hardware.